Finally, a claycourt which is ideally suited to Australia’s climate and conditions. Har-Tru, a proven global company for more than 50 years, has facilitated more than 40,000 courts internationally, including its implementation as a Grand Slam surface when the US Open was played on Har-Tru. Har-Tru then harnessed world’s best practice to produce the acclaimed HydroCourt. Boasting the only proven self-regulating system that is totally adjustable to conditions and player preferences, the HydroCourt is the ideal fit for the diverse Australian climate. In the United States alone, nearly 2,000 HydroCourts have been built along with many more in Canada, England, France, Japan, Turkey, the Caribbean, Spain and the Middle East. The HydroCourt is the ideal scenario for the Australian climate. It is the only self-regulating system that is totally adjustable to player preference. Depending on those preferences, the surface moisture can be increased, decreased or ‘pumped’ to deliver the desired irrigation result. Added to this is the unique sub-surface irrigation system that reduces water usage and waste. A HydroCourt can also be built over existing clay, asphalt or concrete courts. Hydrocourts are constructed with six individually controlled cells. Each cell is monitored by separate water filled control box. Water enters the control box and flows through pipes to cells lined with a chemical resistant, two centimetre thick hyperplastic liner. As the water level in the control box rises, you control the amount of moisture in the court surface by adjusting the water level in the control box up or down – it’s that simple. Hydrocourts supply only the amount of water necessary to keep the surface sufficiently damp. This is revolutionary especially in extreme climates and can result in up to 70 per cent savings in water usage. Over-watered and under-watered areas are common problems with conventional court watering systems. The Hydrocourt system provides better coverage on the surface by dispensing water more evenly underneath the court. Because this process is automatic, there is no loss of playing time for brushing and watering. The court plays the same all day therefore enabling the benefits of consistent play. The Hydrocourt system eliminates the traditional maintenance sprinkler system. The self-regulating system of the Hydrocourt provides a constant level of moisture which keeps the surface firm and substantially reduces the amount of brushing and rolling needed to properly maintain the court. The Hydrocourt is ready for action in a matter of minutes after a rain shower. Water is absorbed through the surface and into the base, much like a blotter. As the court retains moisture and breathes during the hottest days of summer, the surface remains an average of 20 per cent cooler. Har-Tru can install its Har-Tru court with a traditional above ground watering system. Har-Tru by its constitution is lower maintenance than its European counterparts and requires less water. Comprising of a polypropylene membrane that is merged with an existing hard or synthetic grass surface and in-filled with Har-Tru, Claytech boasts the look and feel of a Har-Tru Green Clay court. Added to this is a specialised line filter, which creates permanent playing lines that require very occasional freshening. Its unique characteristics combine to produce a court which requires little to no attention and maintenance, and its virtually non existent water requirements makes Claytech an ideal choice for an indoor clay court. Court Craft Management visited Wimbledon’s 8 HydroCourts to observe maintenance practices. 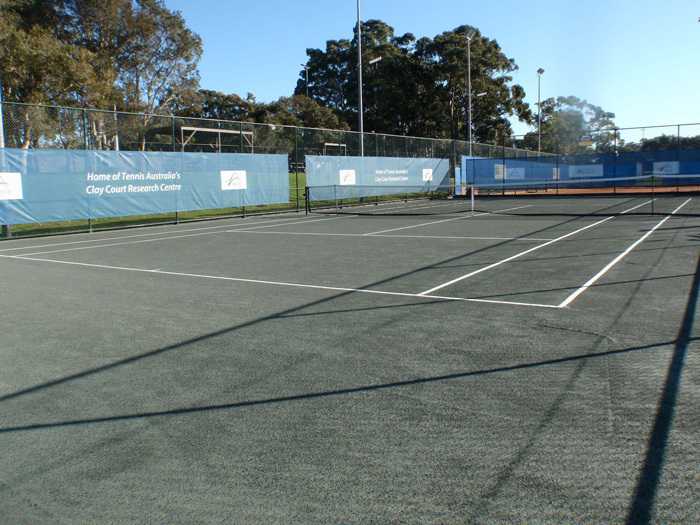 Tennis NSW employed Court Craft as part of their Clay Court Research Project to install Har-Tru HydroCourt at Macquarie University.